A red, painful bump on the eyelid could be a stye. Often resembling a pimple or boil, it appears near the edge of the eyelid. With a sty, one of the eyelash follicles or a meibomian gland gets infected or inflamed. While styes are not usually serious, they can be painful and cause eye watering. If they are short-lived, they may go away on their own. Styes can often be treated at home through warm compresses and specific herbs, though if severe or if it does not clear up within a couple of weeks, see your eye doctor. Redness, swelling in one place on the outside of the eyelid, and pain when touched are symptoms of an external sty. The eye might feel like it has sand in it, and it can be watery and more sensitive to light. 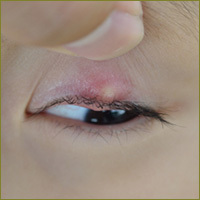 An external stye may resemble a pimple. Unlike with a pimple however, a patient should not squeeze it to remove the pus. Often styes burst and drain on their own or with minimal treatment. Internal styes are red, painful bumps under the eyelid. They are often close to the edge of the lid. Styes are different from blepharitis, but both conditions can exist simultaneously. Blepharitis is inflammation of the eyelid, while styes are localized. Blepharitis is usually caused by bacteria or malfunctioning of the meibomian gland. Styes are also distinct from chalazia. Appearing similar to a cyst, a chalazion is an inflamed lump on the eyelid, and it is caused by a blocked meibomian gland. They are often larger than a sty, and they do not hurt. 1 A sty on the inside of the eyelid is called an internal hordeolum. If an internal hordeolum does not drain and heal, it can turn into a chalazion. There are two types of styes. External hordeola: At the base of eyelashes are follicles from which the lash grows. The oil duct can become blocked, and bacteria can infect the follicle. Bacteria can get trapped with dead skin cells on the lid’s edge. When an eyelash follicle becomes infected, the type of bacteria is usually staphylococcal. 2 The infection results in a sty while the body fights off the bacteria. They appear at the edge of the eyelid, where the eyelashes grow. Internal hordeola: There are around 50 meibomian glands on the upper eyelids and 25 on the lower lids. 3 They supply a special oil that helps prevent the evaporation of tears. Malfunctioning meibomian glands can lead to chronic dry eyes. It looks like a red bump inside the eyelid, and it is painful. An internal hordeolum can turn into a chalazion. Children and teens are especially prone to styes due to their predilection for rubbing their eyes with dirty hands. Teens’ oil secretions are erratic, exacerbating the problem. External styes are easy to spot in the mirror. They can be uncomfortable, making patients want to find relief. Most of the time, styes swell for approximately three days, then they break open on their own. The pus drains and usually heals within a week. 4. Internal styes can take three weeks to resolve. Sometimes an internal hordeolum turns into a chalazion. It starts out as a red lump, but then becomes a hard, painless lump. In this case, medical care may be warranted (see more about chalazia). Prognosis is good, especially if the problem clears up quickly. They are not thought to be contagious. Styes often go away on their own in one to three weeks; they can often be treated at home. A medical professional should be consulted if the symptoms continue more than a few weeks; vision is compromised by eyelid swelling; there is pain in the eye; or styes keep coming back. If styes recur, it could be caused by contaminated eye makeup. If this is the case, discard your old makeup and buy new, preferably organic makeup with no chemical additives. The most basic home treatment is warm compresses. Dip a clean washcloth in very warm water, wring gently, then close the eye and hold the compress to the eye until it starts to cool. Repeat 2 to 6 times per day. Avoid applying eye makeup and eye lotions. Do not insert a contact lens in the affected eye. Do not touch the eye with dirty hands, or soiled towels or washcloths. If you need to see a doctor, he or she may prescribe antibiotic drops or ointments. Follow the doctor’s instructions. It is not common for excision to be necessary. Never squeeze a sty; it will make the situation worse. Keeping the eyelids clean helps styes heal faster and prevent future problems. You can buy an eyelid scrub and follow package directions. Or put a few drops of baby shampoo in a cup of water, stir, dip cotton balls in the liquid, and gently brush along the base of your eyelashes (with eyes closed). Do not get soap in the eyes. Rinse. You can elect to add pure ingredients to the compress water, such as chamomile tea to reduce inflammation or burdock, forsythia, goldenseal and echinacea, or try our EyeEase Formula. Natural Eye Care offers a Sty Care Kit that keeps the compress hot, frees up your hands and includes the EyeEase Formula. Taking the EyeEase Formula orally (by mouth) can also support the eye, especially during an acute flare-up. Styes are quite common problems. Hygiene is primary in preventing them. When they happen, warm compresses and other commonsense home remedies can be helpful. Always consult a medical professional if you have concerns, pain, or if an external sty that does not clear up within one week or an internal one (on the inside of the eyelid) in three weeks.